A Life of Sugar and Spice: Cookies? Yes please! No wait, I'll pass, thanks. Cookies? Yes please! No wait, I'll pass, thanks. 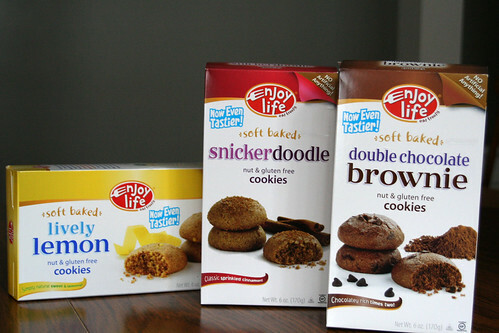 Before I decided to try out the Paleo diet, Enjoy Life Foods contacted me to see if I'd be interested in receiving some complimentary samples of their improved soft baked cookies. Well, who says no to free cookies? NOT ME! I have tried their soft baked cookies before and I have to be honest, I wasn't a huge fan. I found them a tad dry and gritty. I was pleasantly surprised to find out that these new and improved cookies are awesome, soft and chewy and flavorful. I really enjoyed them. I didn't even feel guilty about it. Well, today was a Valentine's Day party at work. I stopped at Whole Foods to grab something to share with everyone. These were on sale so I grabbed a couple of boxes. There were some leftover so I brought them home. Now I'm sitting on the couch next to an almost totally eaten package of double chocolate brownie cookies. Ugh. Listen, I have no guilt over eating some cookies once in a while. I just happened to go a little overboard today. In general, the new lifestyle is going great. I feel awesome! I've noticed that my skin is getting significantly better, it's usually so dry and it's softer and smoother now. My hair seems to be growing like crazy. I am happier, calmer, sleeping better. The rash is getting better. I am seeing nothing but improvements. Eating grain based foods now just makes me feel bloated and weighed down. I really enjoy eating a ton of veggies every day and find that I crave them. I'll write a better post about my progress later. I don't want to steal the thunder of the cookies. This post is, afterall, about them. For those of you looking for tasty, store bought, allergen free cookies, these are a great choice!! Disclaimer! Yes I received these cookies for free, however the opinions expressed here are my honest review. If I didn't like them, I'd tell you! I love this brand! The texture is great. Thanks for sharing! It's good, but I hit a wall last week during valentine's day. Which made me realize how much better Paleo makes me feel! So I'm back on track. I'll hopefully get a post up soon! Brussels Sprouts, Bacon and POM = Wonderful!